You can now ask your question related to this facility. Please go to the bottom of this page. ** The Opal card is the centrepiece of the new electronic ticketing system and is a smartcard, similar in size to a credit card. The Opal card will provide an easy, convenient and fast new way of travelling on the public transport network in Sydney, the Blue Mountains, Central Coast, Hunter, Illawarra and the Southern Highlands. ** Instead of buying a paper ticket you load value onto your Opal card via a range of convenient options to pay for your fare and you keep your card on a permanent basis. ** When you tap on at an Opal card reader to start your journey, and tap off* at the end of your journey, the system will automatically calculate your fare and deduct it from the value stored on your Opal card. Adult and Child/Youth, which are both now available as registered or unregistered cards. 2.full time NSW/ACT school students aged 16 years and older with a Senior Secondary Student card, issued by their school, as proof of entitlement. ** The Child/Youth Opal card is separate from the School Student Transport Scheme (SSTS) however, where students are not eligible for the SSTS, it may be an option. Child/Youth fares are priced at 50% of full fare adult Opal rates, rounded down wherever necessary. ** Tertiary students, including university students, are not eligible to use the Child/Youth Opal card. Until the Concession Opal card is released, you can purchase your paper tickets from more than 1,600 ticket sellers across Sydney including news agencies, 7-Eleven convenience stores, Australia Post and selected Woolworths stores. ** The Gold Senior/Pensioner Opal card will be available soon and is for customers with a Seniors Card or Centrelink Pensioner Concession Card. ** Until the Gold Opal Senior/Pensioner card is released, you can continue to purchase your Pensioner Excursion Ticket from a ticket seller before you board your State Transit bus. ** Pensioner excursion tickets are available from more than 1,600 ticket sellers across Sydney including news agencies, 7-Eleven convenience stores, Australia Post and selected Woolworths stores. ** The Concession Opal card will be available soon and is for customers holding an eligible Concession card. ** Until the Concession card is released, you can continue to purchase Concession tickets from more than 1,600 ticket sellers across Sydney including news agencies, 7-Eleven convenience stores, Australia Post and selected Woolworths stores. You can now pick up an unregistered Opal card from one of our many retailers. Until the 5 October, you can pick up and load a new Adult Opal card with $20 only, or a new Child/Youth Opal card with $10 only, using your Visa card, MasterCard or EFTPOS at one of our pop-up kiosks at selected Westfield shopping centres and times. Until the end of September, there will be four ‘roaming’ kiosks across 18 NSW TrainLink stations. You can pick up and load a new Adult Opal card with $20 only, or a new Child/Youth Opal card with $10 only, using your Visa card, MasterCard or EFTPOS at one of our roaming kiosks at selected train stations and times. Until the end of September, you can pick up and load a new Adult Opal card with $20 only, or a new Child/Youth Opal card with $10 only, using your Visa card, MasterCard or EFTPOS at one of our pop-up kiosks at selected train stations and times. You can order your Opal card online. The Opal online ordering process will only take a few minutes – register and add value to your Opal card and we will mail it to you. It’s that easy! If you don’t want to order your card online, call 13 67 25 (13 OPAL) and talk to one of our Opal Customer Care representatives. 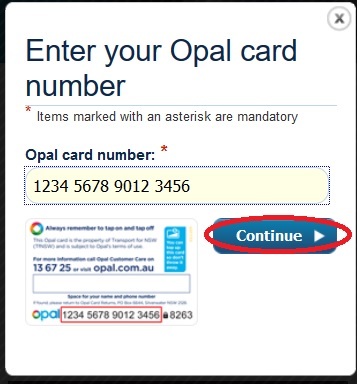 If you order your card over the phone, you will need to create an Opal online account to view your card details online. ** Your balance is displayed every time you tap on or tap off*. ** Visit an Opal card retailer and ask to check your balance. *Or when you tap on for the Sydney Ferries Manly service. What is the balance of opal card 3085-2200-7367-1444? My previous reference number is 17335271. If a card is reported lost or stolen or has been replaced it cannot be reused. Replacement Opal cards may take five to seven working days to be delivered. HOW TO CHECK BALANCE ON MY OPAL CARDS ONLINE?